Are you suffering from skin pigmentation and dark spots that make your face look unlikeable and unappealing? Bleaching creams have long been used to treat dark spots and pigmentation and to lighten the skin tone. These creams are safe and effective for use on face and other parts of the body and they help you to get a glowing and bright skin in just a few simple steps. Bleaching creams should be used with caution as they can cause damage to the skin if used incorrectly or in large amounts. This is why it is essential to choose a bleaching cream with a gentle formula which acts effectively in lightening the marks. This organic bleaching cream comes with anti-aging benefits and contains safe ingredients that give you a brighter and lighter skin from the first use. The formula contains aloe vera extract, coconut oil, and collagen along with other natural extracts which improve the texture of the skin and work on dark spots and blemishes. It is advisable to use the cream for a few weeks before expecting visible results. The formula does not have a very strong fragrance. You can use this cream on all parts of the body except the intimate areas. The tub packaging is easy to use and the quantity is good for a reasonable price. The formula lightens the skin and also has anti-aging benefits. It contains natural ingredients which nourish and hydrate the skin while lightening the blemishes and dark spots. The tub packaging is convenient to use and the quantity is good for the price. It gives you visible results in just a few weeks of usage. It can cause a bit of skin irritation and redness after use. The formula does not work on darker skin tones. This bleaching cream provides multiple benefits apart from lightening the skin tone and improving its texture. The formula does not have a strong bleach fragrance and can be used on the face as well as hands and legs. With 2% hydroquinone, this bleaching cream works on hyper pigmentation and helps in lightening even the most stubborn dark spots. It lightens the overall skin tone as well as specific areas on the skin that need more attention. The formula is a bit strong and has a strong fragrance so it is better to use it sparingly. It is advised to not step out in the sun after using this cream as this decreases the potency of the formula. The cream contains vitamin E, Shea butter, and coconut oil which hydrate the skin and prevent moisture loss. The price of the cream is moderate as compared to other bleaching creams. It contains 2% hydroquinone which is a powerful skin lightening agent. Shea butter and coconut oil prevent moisture loss and aid in healing the skin. The jar packaging is travel-friendly and the formula works for all skin types. It works effectively on dark spots and lightens them in just a few days. The formula is quite strong and has a strong smell. You cannot step out in the sun for a few hours after using the cream. Hydroquinone can be a powerful bleaching agent but the non-toxic base ingredients of this cream reduce its toxicity and improve its effectiveness on dark spots and pigmentation. Suitable for minor discolorations, the Ultra Bright lightening cream comes in a handy tube which is quite easy to use and travel-friendly as well. It has a hydrating formula and feels lightweight on the skin. It can be used on both face and body but it is recommended to do a patch test before using the cream. It has a pleasant smell and lightens the skin significantly if you use it regularly. Make sure you wear a sunscreen after using this cream and stepping out in the sun to prevent further discoloration of the skin. You need to apply a thin layer of the product on the skin and massage it lightly on the dark spots. The price of the cream is quite affordable but the quantity is a little lesser than other bleaching creams. The formula is suitable for minor discolorations and small dark spots. It is very gentle on the skin and has a pleasant fragrance. The tube packaging is very handy for travelling purposes. The price of the product is affordable as compared to other creams. The quantity of the cream is a bit less and it gets over quickly. The formula might react on sensitive skin if left for too long. This cream is great for travel purposes and fits perfectly in your bag for keeping your skin discolorations at bay with its gentle yet effective formula. It is a good option to consider if you have minor discolorations and pigmentation. If you are looking for an affordable bleaching cream, the Black and White bleach cream is a good option to consider. It contains hydroquinone which lightens the skin over time and fades away blemishes and dark spots. The tube packaging is very convenient and regular use of the cream gives you a smooth and even skin tone over a period of time. You only require a little amount of cream to lighten spots and it also works on age spots. The formula contains 2% hydroquinone and has a rosy fragrance. The price of the cream is very affordable and the quantity lasts well as compared to the price. The fragrance of the cream is very soothing and it does not irritate the skin. The tube packaging is easy to use and reduces product wastage. The price is quite affordable and it is one of the cheapest bleaching creams available. A small amount of cream goes a long way in treating discoloration and age spots. The formula takes some time to work on stubborn spots. The strong rose fragrance might not be preferred by some users. This cream is quite affordable and is so gentle on the skin with its light formula and pleasing fragrance. Hydroquinone works effectively on age spots and pigmentation and is not very harsh on the skin. Made with vitamin C, green tea, and hyaluronic acid, this whitening cream from Whitening Labs comes in a sturdy jar packaging and is made up of 72% organic ingredients. Apart from the above ingredients, it also contains jojoba oil and aloe vera which help in cell renewal and improve the texture of the skin. Hyaluronic acid prevents signs of aging and makes the skin appear firmer and smooth. The formula is smooth and hydrates the skin well while lightening the pigmentation spots and uneven skin tone. The quantity is great and the price of the cream is affordable as compared to the quantity as one jar lasts for around 5-6 months easily. The cream contains 72% organic ingredients like aloe vera, jojoba oil, and green tea extracts. The quantity is very good for the price and the jar packaging is sturdy. The skin appears younger and lighter with regular use. Vitamin C and hyaluronic acid help to lighten dark spots and work in fighting signs of aging. It contains palm oil which is not very beneficial for the skin. The formula might be too heavy for people with an oily skin. This bleaching cream is very beneficial for the skin as it lightens the marks and reduces dryness and signs of aging also. The organic formula and natural ingredients work gently on the skin without causing any further damage. If you are looking for a skin whitening cream for including in your night skincare routine, the Equatone brightening cream is perfect for you. It comes in a convenient tube packaging and shows visible results in just a few weeks. The formula is rich enough to hydrate the skin at night and help in the cell renewal process. It does not cause any skin irritation and improves the skin tone gradually. It works on sun spots as well as pigmentation and lightens these spots if you use it regularly. The quantity is very good and the price of this bleaching cream is quite affordable. The night cream helps in cell growth and renewal to lighten dark spots and hyper pigmentation. The tube packaging is very convenient and is travel-friendly also. The cream hydrates the skin well and absorbs quickly into the skin. It is suitable for all skin types and the quantity is good for the price. You will have to buy a separate bleaching cream for day use. The formula can be too heavy for people with an oily skin. This bleaching cream is a great night skincare product for people who want to lighten their dark spots and pigmentation marks. It shows visible results and hydrates the skin very efficiently. Formulated with organic lemon and orange extracts, the Spa Basin bleaching cream is a multipurpose product that comes with SPF 15 to protect the skin from further sun damage. It comes in a convenient jar packaging and contains honey, antioxidants, bearberry extracts, allantoin, vitamin A, vitamin C, and vitamin E. Regular use of this cream helps in achieving even skin tone and it works on stubborn pigmentation marks as well. The quantity is good for the price and the jar packaging is travel-friendly. The price of the cream is very high but its potent formula makes it worth the high price. It contains organic brightening agents like lemon and orange extracts. The SPF15 makes it a multipurpose product which provides sun protection. Regular use brightens the skin and evens out the skin tone. It is suitable for all skin types and does not irritate the skin. The price of this bleaching cream is very high as compared to other products. The jar packaging is a bit unhygienic as you have to take the product out with hands. The gentle formula of this bleaching cream along with SPF 15 works efficiently on the skin and lightens marks significantly with regular use. The price is high but the quantity lasts well for the price. 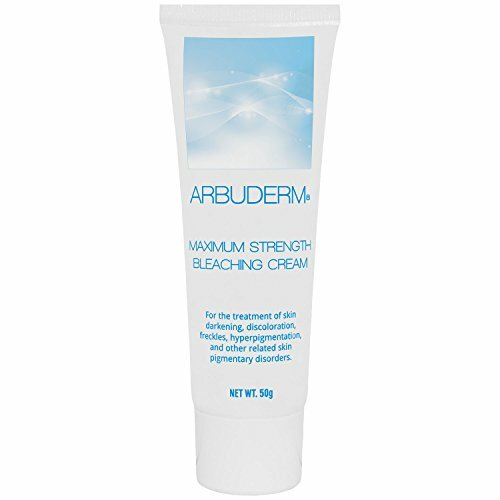 If you are looking for a potent bleaching cream, the Arbuderm bleaching cream contains powerful bleaching agents that are ten times as powerful as Hydroquinone and are suitable for both face and body. The convenient tube packaging and the flip-open cap make it very easy to use the cream during travelling. It contains alpha arbutin that is derived from Bearberry. The formula is very strong and works well in lightening the darker areas of the body. This cream enhances the radiance of the skin and prevents further darkening. The price of the cream is moderate and the quantity lasts for 3-4 months. It contains high-quality ingredients derived from bearberry and liquorice. The formula is very potent and is suitable for use on sensitive areas as well. It has a pleasant fragrance and improves the radiance of skin. Alpha Arbutin is stronger than hydroquinone and safely bleaches the darker areas. The strong formula should be used carefully and only after consulting a dermatologist. The formula leaves a white cast on the skin. The highly potent formula of this bleaching cream lightens even the darkest areas and helps in improving the overall evenness of the skin. It is convenient to use and gives quick results. Suitable for private areas, this bleaching cream is affordable and does not harm the skin even with prolonged use. It uses natural ingredients and herbs to lighten and brighten the skin. It does not use any harmful bleaching agents which bleach the skin temporarily. The cream hydrates the skin and evens out the skin tone if you apply it regularly on the affected areas. It is suitable for use on all parts of the body including the sensitive area and neck. The quantity is good as one tube lasts for 4-5 months if used twice daily. The price is very affordable. The cream contains many natural ingredients which bleach skin naturally. The formula is very hydrating and forms a barrier between the skin and the atmosphere. It is suitable for the sensitive areas of the body and does not irritate the skin. The cream has a very affordable price and the quantity is good. It takes some time to show results if used on stubborn dark spots. The formula can be a bit heavy for people with oily skin. This bleaching cream works well for the sensitive areas of the body where the skin is very delicate and needs gentle products. It uses natural herbs and ingredients which lighten and brighten the skin gradually. 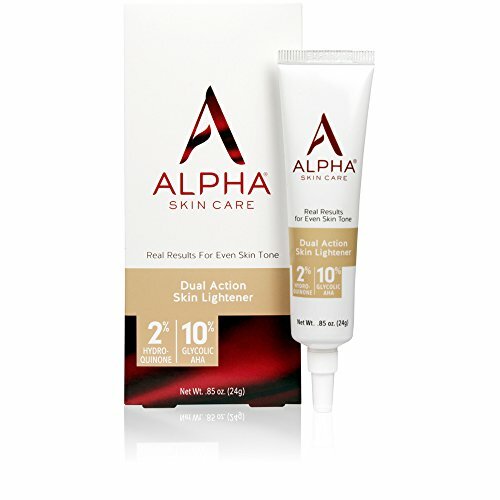 A multipurpose skincare product, this cream from Alpha Skincare combines the effects of hydroquinone and AHA Glycolic acid and improves the condition of the skin significantly. It contains 2% hydroquinone and 10% glycolic AHA which enhance the collagen production in the skin and lighten age spots. The cream also contains vitamin E which nourishes the skin. The applicator helps to take the desired amount of product without causing any wastage. The price of the cream is quite affordable. It contains glycolic AHA and hydroquinone which lighten the skin and reduce uneven skin tone. The cream comes with an applicator which can be used to apply the product. The formula is very nourishing and does not feel heavy on the skin. It comes at a very affordable price as compared to the quantity. The formula can cause slight redness during the first few uses. The tube gets over quickly if used twice daily. This skin lightener works wonders on your skin if you use it religiously as it contains ingredients which lighten and nourish the skin without causing any discomfort or irritation. The formula of the cream should be gentle on the skin and not too strong as it can damage the skin. Bleaching creams should be used sparingly and always do a patch test before applying it on the face and the sensitive areas. Look for creams which contain natural bleaching agents like lemon extracts and hydroquinone which are safe and effective in bleaching the skin naturally. Keep your skin type in mind while buying a bleaching cream as different formulas work differently on all skin types. Do not use very strong formulas on sensitive skin as they can irritate the skin and cause red patches. Read the product description carefully to see if it suits your particular skin type. Most bleaching creams come in a jar packaging but some of them also come in tubes which are easier to use during travelling. Tubes are also very convenient to use when you want to apply the bleaching cream on hard to reach areas. Use a spoon to take out the cream if you are using the jar to maintain hygiene. You can buy a good bleaching cream in $10 – $25 depending on its quantity and brand. Some creams are more expensive than others as they contain natural bleaching agents instead of strong artificial bleaching ingredients. You can look for online discounts but do not buy a cream which is very cheap as it might contain artificial bleaching agents which can damage your skin. Read what the other customers have to say about a particular product before you purchase it to understand how the product works. These reviews also give you a clear idea of the effectiveness of the product and whether it will suit your skin type or not. So these are ten of the most popular bleaching creams available in the market. These bleaching creams are safe for the skin and some of them can also be used for lightening the skin of sensitive areas like armpits and private parts. Using a bleaching cream is very common these days to achieve a lighter skin tone and they are very safe to use regularly. This buyer guide will help you find the right bleaching cream for all skin types. Have you tried a bleaching cream? How was your experience? I wonder how long I have to use bleaching cream until the result shown? It depends on many factors around you such as the performance of your product you use, your skin type, and whether you follow the instructions. Normally it takes about 3 weeks to see visible result or some changes. Is it possible if I use facial bleaching for bleaching hair? 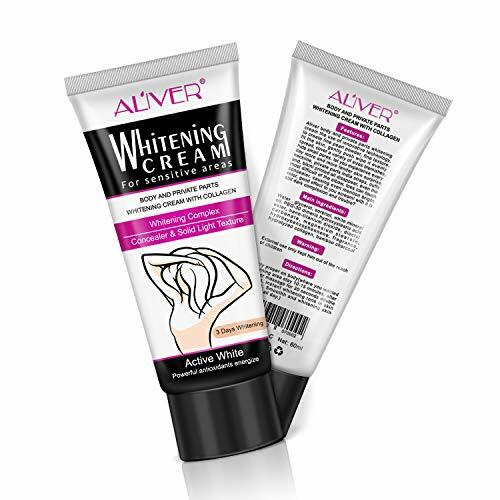 Facial bleaching cream contains soft formula compared to hair products. I suggest you to choose the right product to the right job. So, you can get the best and real result. Jenny! That’s great! I love KissRedE Whitening Cream.